ArtPaths is an art walkway program that features 23 unique artworks created by Columbus College of Art & Design students on over 400 construction barricades that line streets throughout the Short North Arts District. 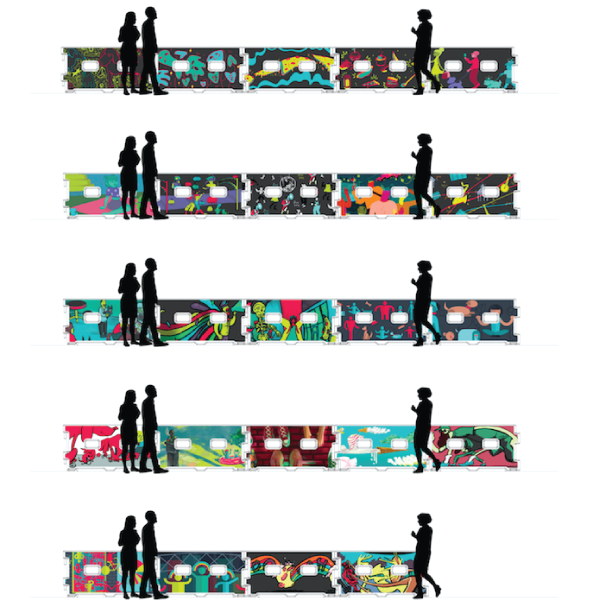 As the barriers will move virtually daily as a part of the City of Columbus’ High Street Streetscape Improvements Project, the artworks were created so that no matter how the barriers are shifted or configured, the artwork will be seen and a cohesive story will be told. Artworks will be installed beginning on mid February and early March, and will be up in the District throughout 2018. ArtPaths is made possible in part by state tax dollars allocated by the Ohio Legislature to the Ohio Arts Council (OAC). The OAC is a state agency that funds and supports quality arts experiences to strengthen Ohio communities culturally, educationally, and economically. Alma Kim is an illustrator and a children’s book writer currently living in Columbus, Ohio. She was born and raised in South Korea, but she lived in Sri Lanka for the half of her teenage years. Her illustration works have been used in the front cover of Columbus Dispatch and CCAD Student Agency publications. Through the whimsical styles of art, she seeks to bring positive changes on the community. Christabel Ramos is an artist from Charleston, West Virginia. She has a strong interest in urban fantasy, nature, and folklore. Though taught with traditional methods and materials, she hopes to blend both digital and traditional aspects in her work, particularly when it comes to animation. Cydney Wiedenbeck is a visual development artist from Wisconsin. Nature has a strong influence on her work, which has been displayed at the Society of Illustrators and CCAD Art of Illustration shows. She is interested in making art for immersive, virtual reality experiences. Hailey Corrigan is an illustration major with a creative writing minor, currently attending the Columbus College of Art and Design, although originally from Boston. Hailey works with bold colors and dynamic shapes to create exciting and creative narratives that dance between reality and fantasy. She’s done several freelance projects, as well as illustrations for the 2017 Columbus Fashion Week, and hopes to work on concept art as well as children’s books once she graduates. Khaila Carr is an artist living in Columbus, Ohio. Her work spans digital, print and three-dimensional forms, often accompanied by a sense of humor, vibrant color, and aspects of her everyday life. Khaila’s work has been exhibited at Wholly Craft, Surprise Modern Party + Cocktail Goods, The CCAD Student Agency, Spitball: A CCAD Comics Anthology, and Bob’s Burgers. Sidney Gale is a Columbus native who is currently an animation major at The Columbus College of Art & Design and is expected to graduate in 2020. Her focus is 2D animation, but she strives to take risks and experiment artistically. She is involved in CCAD’s Animation Student Collective, Queer Alliance, and Empowering Feminists of Campus organization. Her dream is to someday create her own show for Cartoon Network, but as long as she can bring smiles to the faces of her friends and family, she’ll feel fulfilled. Right now, she’s creating the art she wants to see more of in the world: work that educates, provides a voice for those in need, and goofy stuff that makes people laugh.